Although almost four thousand Meteors would be built through the decades, they only saw action by the end of World War II, killing 14 V-1 flying bombs in air and 46 Germain aircraft through ground attack. But because of fear that the bird would fall to the enemy, the Meteor never confronted German jet aircraft during the war. The Meteor was a successful fighter which greatly improved through new versions. One particular airframe modification added 120 km/hr at higher altitude due to aerodynamics alone. The gradual change from Derwent I to Rolls-Royce Derwent engines, as well as additional fuel capacity, also made an important difference. Nevertheless, the Meteor would become obsolete in the 1950s, due in part to its straight wing design. The Meteor served in Great Britain as well as in Australia, Argentina, Egypt – where it saw action during the Suez Crisis of 1956 – Syria, France, and Israel. 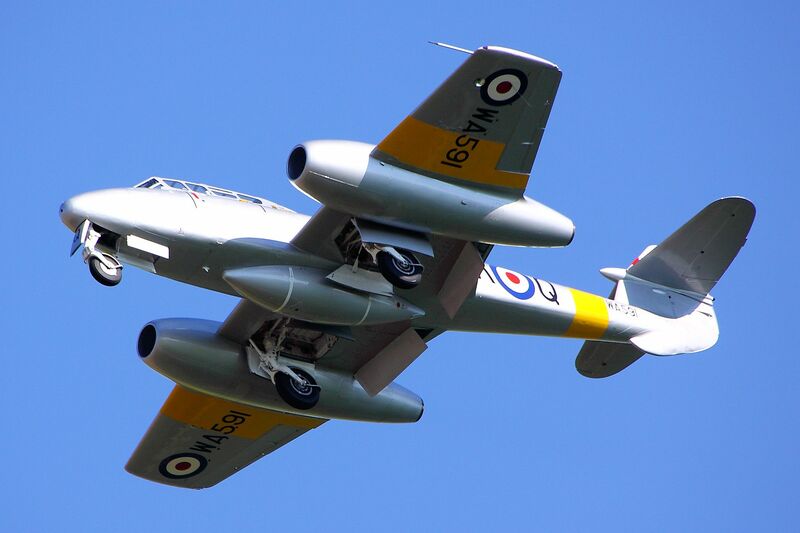 Being a first jet fighter, the Meteor naturally set many world records such as the London-Copenhagen-London speed record, and a jet endurance record (staying aloft 12 hours by aerial refuelling). It remained active until the 1980s. In the RAF alone, 450 pilots died in the Meteor and 890 airframes were lost. Factors such as short flight endurance due to high fuel consumption, the early lack of ejection seats, and difficulty of ejecting without striking the tailplane were contributing factors to the numerous deaths. The Meteor was the first operational Allied jet. Unless otherwise mentioned, this webpage and its content is licensed under the Attribution 4.0 International license. You may quote and copy this material if you give correct credit to the author and do not distort or otherwise change the original meaning of his words. Copying any material on this website without giving correct credit to the author is both plagiarism and copyright infringment, and will be treated as such. Denis G. Labrecque published this document on July 19, 2016. Proudly hosted on GitHub using Jekyll markdown.